How Long Can a Large Parrot Live? A large parrot may be part of your family for 50 years or longer. Dogs and cats are companions for less than 20 years. If you want a pet that will spend a longer life with you, consider a large parrot. A large parrot may be part of your family for 50 years or longer because the average life expectancy of an Amazon parrot is 50 to 70 years. Have a plan in case your feathered friend outlives you, because a large parrot can be a lifetime commitment and beyond. Parrots have been kept as pets for hundreds of years, and they are still popular pets today. Many people don't realize the lifetime commitment that comes with most parrots. In general, the larger the bird, the longer he will live. However, not all birds will live such long lives. Heredity plays a role, as some birds inherit health issues that shorten their lives. What you feed your parrot also will determine how long he will be with you. A parrot who eats a healthy diet that's close to what he would eat in the wild will generally live a longer life. With good food, good veterinary care and lot of mental and physical exercise, a large parrot could stay in your family for three generations. Macaws are the most colorful parrots, originally found in Central and South America. Macaws are the largest family of parrots, and some can grow as tall as three feet and weigh up to 4 pounds. Since they are the largest parrots, macaws also have the longest life expectancies. If a young macaw joins your family, it probably will outlive you, as healthy macaws can survive 60 to 80 years. Even the smaller macaws, like the Hahns macaw, can live up 60 years. If you want to spend your life with a colorful, feathered friend, a macaw might be a good choice. 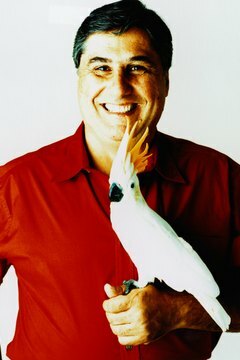 Cockatoos, with their fluffy crests and silly antics, are well known to many Americans because of Fred, the bird co-star of the TV show "Baretta." Cockatoos evolved in the South Pacific countries of Australia, New Zealand, Indonesia and surrounding islands. The largest cockatoos can weigh over 2 pounds and the smallest of the cockatoo family, the cockatiel, may weigh only 3 ounces. Because of the size difference in cockatoos, the life span varies greatly. The small cockatiels may live up to 20 years, while the larger cockatoos can live 60 years or more. One of the most famous and oldest cockatoos is Cookie, the resident Major Mitchell's cockatoo at the Brookfield Zoo in Chicago, who celebrated his 79th birthday in June 2012. Amazons are smaller parrots than macaws or cockatoos, but they are still large enough to be a lifetime companion. Most Amazons are are about the size of a pigeon and many are very colorful. Amazons parrots can be very intelligent, talkative and playful. The average life expectancy of an Amazon parrot is 50 to 70 years. As a result, you should be prepared to spend a lot of time socializing your Amazon parrot for years. African grey parrots are about the same size as Amazon parrots and have about the same life expectancy. With good nutrition and care, an African grey parrot will be your companion for 50 to 60 years. Some African greys have lived to be older than 80 years of age. These gentle birds are considered by many experts to be smartest of the parrots. If you want a parrot that can carry on a full conversation with you, an African grey might be a good choice. They are so good at talking that they can even mimic the different voices of their human friends. Are There Any Vegetables That Are Harmful to Parrots? How Can I Stop My Parrot From Screaming at My Husband?